Mood boards can be a great way to convey your design idea, win pitches and get an early sign-off. Follow this expert advice on how to create them. When trying to convey a design idea to win pitches and get an early sign-off, moods, feelings and visions can be difficult to communicate verbally. So designers will often use mood boards: a collection of textures, images and text related to a design theme as a reference point. Mood boards help others to 'get inside our heads' as they show what you're thinking and feeling about a creative idea and your intended vision for a piece of work. That said, mood boards can be a pain to create, with many hours spent trawling image galleries, websites, books and magazines looking for that perfect image to sum up your intended feel for the work at hand. 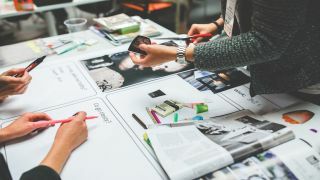 The right tools for creating mood boards can help, as can the following tips on making your mood board process more effective – increasing your chances of winning that pitch. When putting together mood boards, it's easy (and therefore tempting) to just use Google Images. But just because you're working on a digital product doesn't mean you have to stick to digital inspiration. For example, while working on the ITV news website, digital product design company Made by Many looked at copies of the veteran Picture Post magazine in order to express how powerful and effective an image plus a caption can be for telling a news story. Real world inspiration such as this can be a very powerful 'convincer' when putting together a board for a client. Real-world inspiration is all around us. So use the camera on your phone to take pictures of everything you see that inspires you, whether that be a bird in flight, great use of typography on a sign, or the brickwork on a building. They don't have to be great photos in the traditional sense – it's all about capturing thoughts, impressions, themes and feelings. Have you ever had the misfortune of going to a gallery exhibition and it just not doing anything for you? You weren't 'touched' by the exhibition or 'moved' by what was on show – and other similar emotive profusions. It's very easy to shove a load of stuff together and call it an exhibition; it's an absolute talent to curate threads and synergies between works and call it an exhibition. When putting together mood boards, think of yourself as a curator rather than a collector, and try to introduce meaning and threads from one image to the next. It makes for easier interpretation. From the outset, establish whether your mood board is going to be presented in person or emailed to the client, as this will determine whether you produce an offline or online mood board. The distinction is not trivial; the two formats demand very different approaches. An offline mood board will generally be looser in style and require the extra kick and emotive spark that comes from it being presented to a client. An online mood board should be tighter and will generally need to work harder to convey a theme or style. Whether your mood board is electronic or physical, the layout needs to give prominence to key theme images. You can then surround these with smaller supporting images that enhance the theme. It's a subliminal trick. When someone sees a large image on your board in their heads they'll have questions about it – which they'll quickly scan the rest of the board to find answers for. If you place smaller supporting images around the larger image they should answer these questions by clarifying the messaging given in the larger one. When making a physical mood board, don't be afraid to get, well, physical. Traditionally, mood boards are made from foam board. Although cutting this stuff up with a scalpel and spray mounting cut-out images onto it can be a pain (especially if you're not dexterous with a blade), it's extremely effective as a presentation tool. The tactile nature of cut-out images glued onto boards enhances the emotiveness of what's being explained. Generally mood boards are considered to be separate to pitch or presentation work: they stand alone to show mood and tone. This is standard practice, but consider instead making them part of your pitch or presentation. Remember, you're trying to use subliminal visual tricks to make a client 'get it'. Mixing mood board elements in with the presentation – rather than bolting them on at the end – can be an effective way of communicating your concept to the client. It's important to make sure that a well-meaning project manager doesn't email an offline mood board ahead of the presentation 'so the client knows what we're presenting'. For an offline mood board, it's far better to let it all sink in to the client's mind as you showcase it, rather than come armed with lots of questions before you even start. In a similar vein, if your mood board is being presented to the client, try to be involved yourself. It makes no sense to have something that originated in your head being communicated by someone else, because that way meaning can become muddled in a Chinese whispers-type mess. Locking an idea or a style down in a mood board can be detrimental, as the client will feel shoehorned into going with a particular aesthetic. Keep everything a little loose and don't make everything look too final. If you're using preview images from image libraries, don't worry about the watermarking on them – it all adds up to a 'hey look, we can change this, these are ideas' feel to the board. When you're presenting an offline mood board, watch the faces of those you're showing it to. Ignore any verbal client 'oohs and ahhs' but instead watch their facial and emotive reactions as they look around the board. This will give you a much more honest take on whether the board is doing its job and if they're reacting well or badly to what you're showing them. You have to put these people 'in your mood', so ignore their mutterings and watch their emotive reactions. Employees at branding agency Landor Associates use a form of mood board to showcase themselves to other members of the team. Individuals put together nine images in a 3 x 3 grid to give their work colleagues an insight into what they're like; their interests, passions, cares and worries. If you ever want to test out your mood boarding skills, try this out and showcase it to your colleagues. Don't ignore the power of a few isolated words on a board. Well-chosen words can be fantastic show-stoppers and give your viewer pause for thought as they have to mentally read what's in front of them. Big, bold words juxtaposed together work very well at creating drama, tone and meaning for any project. Obscure references can be fun, but try to have a number of relatable items or 'touchpoints' in your mood board. You want to let others in, so being deliberately obtuse will earn you no points at all. It's easy to fill out a board with a pile of incomprehensible references; it's much harder to be clear and use imagery to sell your vision. But it's worth the effort. Think a little bit left of centre if you're presenting a mood board to a client. What would give them a genuine emotive response? Real world objects are good for this. If you were inspired by the beach, bring in a shell. If your eureka moment happened on the train, bring in the ticket. This type of thing intrigues people's brains and gains that all-important emotive reaction. Expecting too much of the audience can be the difference between a successful mood board and one that's dismissed as being too cerebral. There's a danger of assuming they'll 'know what you mean' – chances are they won't. So if it takes a few more references, images or textures to get what's inside your head into a client's then add them in. Don't forget to test out your boards before you send them off. It's not a game of Pictionary, so if your testing audience have to ask too many times what an image means or why it's there, then it probably shouldn't be there. Following on from the previous point, mood boards are a good way to brief a creative. Don't be afraid to go into detail. The mood board above was compiled for animator Tom Baker as a mood and style guide for creating cartoon versions of The Avengers TV series characters. Instead of relying on one example of a character, several types were found in many different poses, which gave Baker a clear take on the style and direction of the piece. Mood boards shouldn't just be for pitches. Consider preparing mood boards to show other similarly themed projects, websites or functions before creating polished visuals. 'I'll know it when I see it' is a phrase that most of us are familiar with. But to hear this when finished artwork comes back from a client is gutting, signifying that it's back to square one. Using mood boards at different stages of the process can help you avoid this happening.